Google Plus Interactive Posts can target your call-to-action button label from a large list of options programatically. It actually does not require any Plugin. 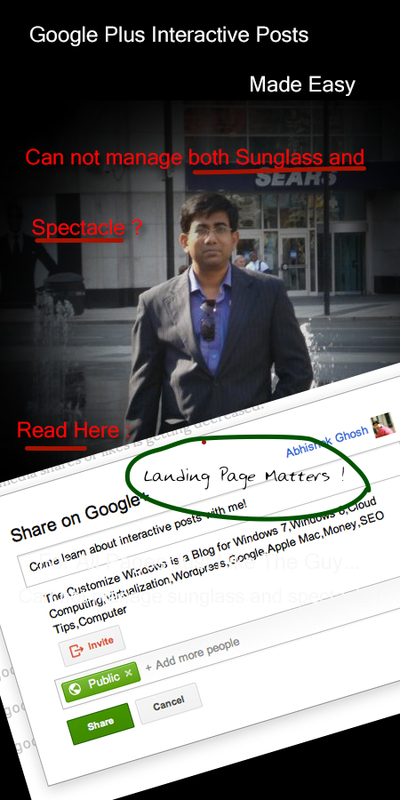 Google Plus Interactive Posts allow your website users to bring attention for a specific purpose. Users via Google Plus Interactive Posts can send shared posts asking people to sign up, write a review, buy an item, check-in, listen etc. programatically set. Google Plus Interactive Posts trigger notifications for the recipients and show up in their Google+ streams exposing your posts to more audience. Click to Check this ! First this is, I changed the code a bit and pasted in HTML mode within this post. Obviously a bit work on CSS would make it to look better ! That is actually easy. The main thing is working, is not it ? I think its easy and you are not smiling like this confused person with two pairs of Google Glass ! The basic thing is, we can easy render the URL using WordPress or PHP call, is not it ? Even if you do not want to manually enter. Second and utmost important thing is the quality of the Landing Page. This Google Plus Interactive Posts button only should be placed on special landing pages – not making the user confused with all other buttons, comment box etc. We basically need our own website’s higher conversion rate not of Google Inc.’s ! Using Judiciously will help you a lot. But adding on all pages / posts has not much value. This Article Has Been Shared 1950 Times! Google Plus Profile Card is not the official name but basically it is more luxurious than Twitter Profile Card offers us. Get the needed tips for coding. Cite this article as: Abhishek Ghosh, "Google Plus Interactive Posts : Tips and Tricks," in The Customize Windows, May 9, 2013, April 21, 2019, https://thecustomizewindows.com/2013/05/google-plus-interactive-posts-tips-and-tricks/.